Ancient writings found in Persia, Iraq (Mesopotamia), Cyprus, Egypt, Israel and Rome, as well as the Far East and India, mention perfume industries that once thrived in these areas. Findings in archaeological sites have been, throughout the years, a rich source of knowledge of history, culture and life styles of ancient communities. 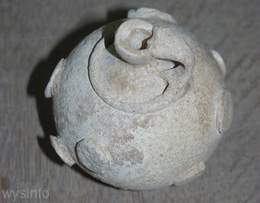 Excavations in these areas often unearth unique perfume containers, some of which are found in almost perfect condition. Various materials were used in antiquity to manufacture containers for the expensive perfume extracts that were in great demand. Clay, stone, metal and glass were the main substances, each with their advantages and disadvantages. 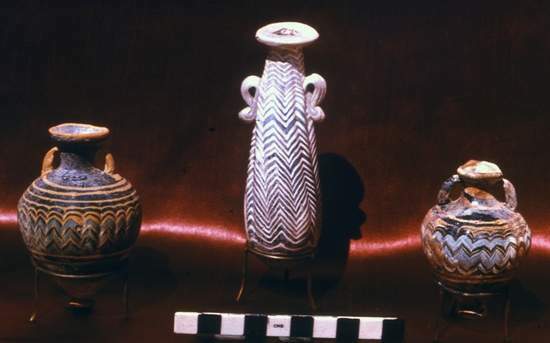 Some containers, like those of clay, were easy to make and blocked sunlight. This was an advantage since light tends to shorten the life expectancy of the perfume. 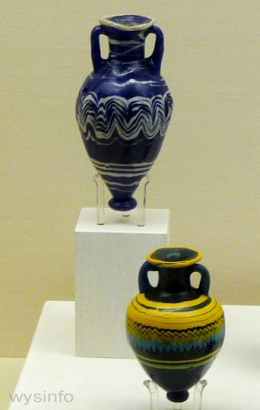 Exhibits of some of the earliest clay jugs used to make and store perfume can be seen in museums of Cyprus. Throughout the Middle East you can find an interesting assortment of clay pot containers, some of which were designed to look like people or animals (sometimes only a few inches in length). Colored or painted glass had, on top of it’s aesthetic properties, the functional value of diminishing the sunlight and being light in weight. 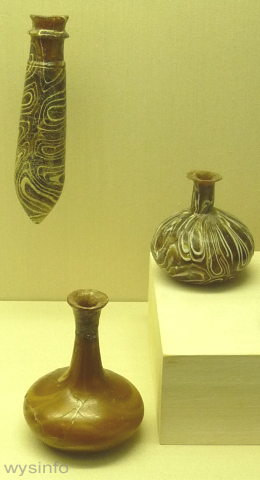 While both clay and glass were breakable, precious metals were durable but very expensive. Semi-precious stones or alabaster were sometimes used because, in addition to blocking light and being non-porous, they tended to keep the perfume cool. As a whole, more expensive perfume was stored in the more expensive and more protective containers. In some cases containers were designed with a mixture of materials. 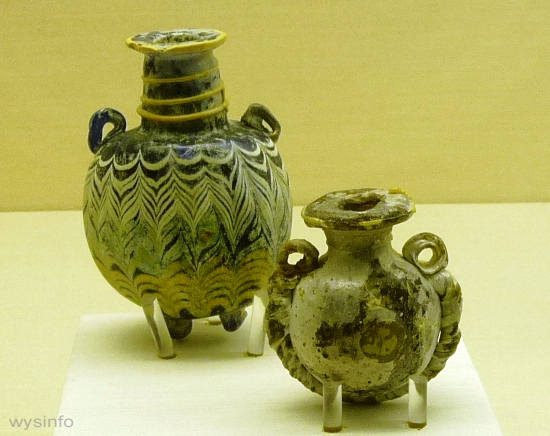 Ancient perfume manufacturing sites are not the only source for finding perfume containers. Since perfume was once an important part of burial practices, many different types of perfume containers have been found in unearthed tombs. Some are highly styled, reflecting the rich lifestyles of the wealthy within the ancient civilizations that designed and used them. Egyptian 18th Dynasty (1334-1325 B.C.E. 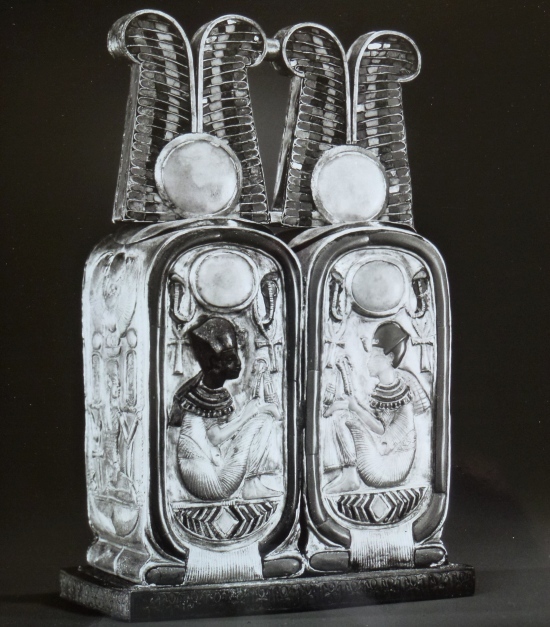 ), perfume box in the shape of a double cartouche, made of gold, silver, glass and translucent calcite – Treasures of Tutankhamun, Cairo Museum. 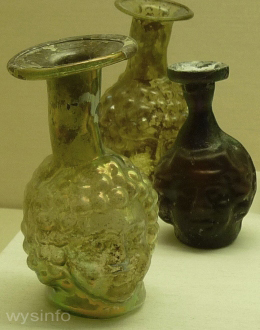 While glass perfume bottles were in use during ancient times in many areas, Rome and Phoenicia were particularly famous for their glassware. Glass bottles, which date back to at least the fifteenth century B.C.E., were non-porous (like stone, alabaster and precious metals) and had the added value of being light in weight. 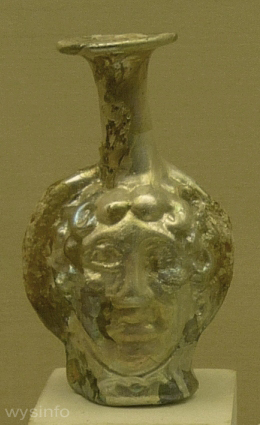 Ancient perfume bottles (unguentarium) were often initially designed for the wealthy in gold and silver, and then replicated in glass. 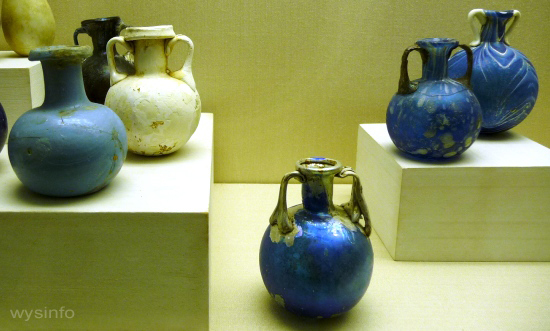 In museums and antique shops throughout the lands that were once Mesopotamia, Phoenicia and the ancient Roman Empire, one can find remnants of perfume vials which are some of the earliest examples of glass objects that have survived from these ancient times. 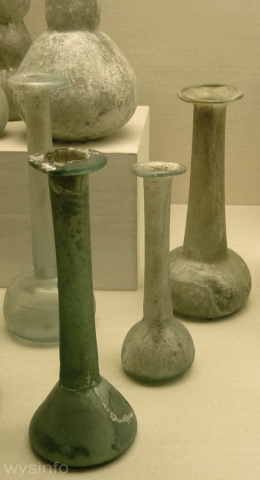 According to the Roman historian Pliny, the first discovery of glass was made accidentally on the Phoenician coast by a group of sailors, possibly near the city that is known today as Acre. The sailors apparently started a fire on the beach in order to prepare food. They were transporting a cargo of ‘natrum’, (subcarbonate of soda). They decided to use some of their cargo to support their cooking utensils and, with the heat of the fire, the blocks of natrum began to melt and combine with the sand of the beach – forming a rudimentary type of glass. 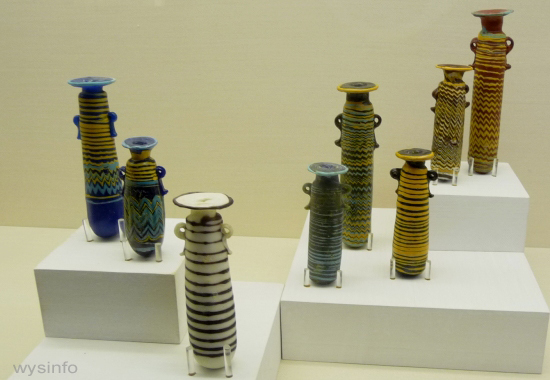 Some, however, would argue that in fact glass was already being produced by the Egyptians before this time. 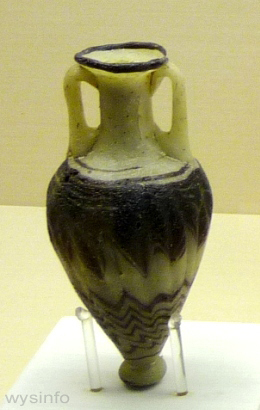 Various glass making techniques were practiced by the ancient Egyptians, Phoenicians and Romans, including a technique called “core-formatting” or core-forming. 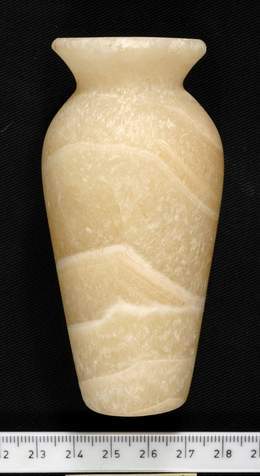 With this technique, the body of the vial was formed on a core which resulted in long and slender shapes, sometimes only a few inches in length. 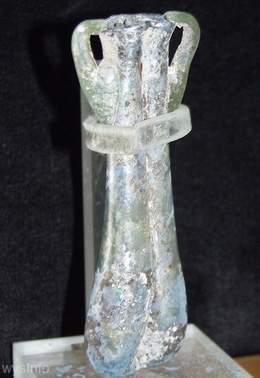 Casting glass bottles in molds was another popular technique used by the ancients. This method appears to have emerged in the 1st millennium B.C.E. some time after the development of core-forming. This technique gained in popularity but did not replace the earlier method of core formed bottles entirely. 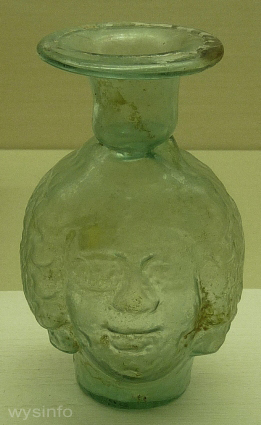 One type of casting method may have involved the use of a wax model which was designed in the shape of the bottle. 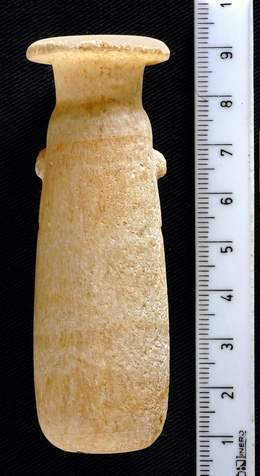 The wax model was covered with clay or plaster, and holes were left at the bottom and the top. When the mold was heated, the wax would run out of the bottom hole. Then the glass was poured into the mold through the opening at the top and the mold was placed in a furnace. 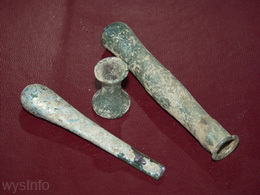 Another method that the ancients used was very similar to the modern glass making technique, involving a melting-pot (requiring extreme heat) and a blowpipe. 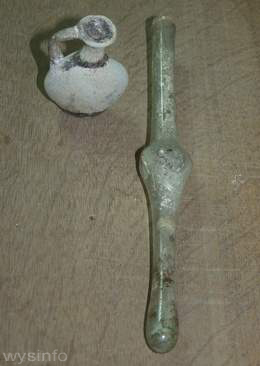 The glass blower was required to blow into the pipe until the glass expanded at its lower end and gradually took on a pear-shaped form. When the glass was partially cooled and hardened, but still had some softness and pliability, it was detached from the pipe and modeled with pincers or by hand into a shape. The final stage was to polish and sometimes cut the glass by means of a turning-lathe. 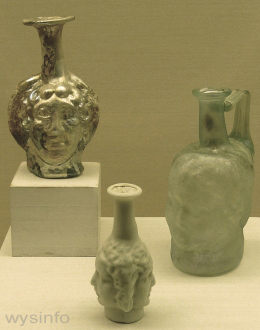 Interesting variations of artistic designs developed using the mold blown method, including perfume bottles that resembled different types of fruit such as grapes or dates, and even bottles that were designed to include heads, usually of mythological figures.